Custom Built 6SN7 or DHT Line-Stage, CR and LCR Phono . 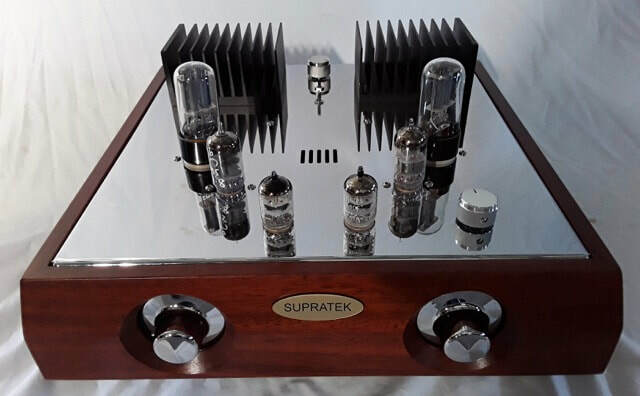 For over 30 years Supratek has produced tube (or valve) preamplifiers and power amplifiers of the highest quality - Supratek is at the forefront of state of the art tube designs, utilising the finest designs, components and transformers available. The preamplifier is the most important component in your system - the preamp is the heart of a good musical system and an award winning SUPRATEK preamp will make your system come alive. Transform your system with these ultra high quality preamplifiers. The Chardonnay is our entry level preamplifier that has sound quality to outperform any preamplifier costing far more. It uses 6SN7 triode tubes in a cascaded 2 stage design that has characteristics of dynamics, musicality and transparency. The 6SN7 triode is unequaled for natural warmth,presence and "you are there" sound. With low output impedance it has an accurate frequency response into any power amplifier. At the heart of every Supratek preamplifier is the tube shunt regulator. This maintains a constant and uninteruptible voltage and current to the circuit at all times, and is a contributing factor to the world famous Supratek sound. A seperate and matching power supply unit ensures quiet operation and because of its massive power transformer and over-engineered parts will provide long term reliability . There are many Supratek preamps operating with 20 years operation on original tubes. Despite it's low cost the Chardonnay is perhaps one of the most beautiful preamps available- with Jarrah wood cabinets and stainless steel or chrome over solid copper chassis. The Chardonnay is unlike any other tube preamp on the market and will transform your system. 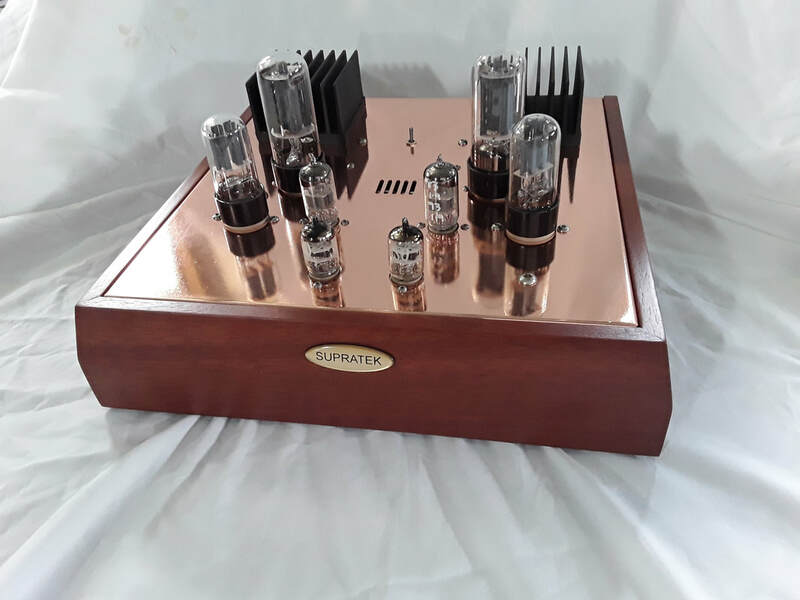 ​The SUPRATEK CORTESE preamplifier is a superlative pre amp with a transformer coupled line stage and a moving coil only phono design using a combination of JFets and EF180, 6H23 tubes to give suitable gain for cartridges as low as 0.2mV with a noise level as good as and surpassing many solid state units. And it achieves this with three valve stages- not the ten or so in many "high tech" modern designs, which curtails transperancy. The design has been refined over many years to be possibly one of the finest MC cartridge tube designs. Loading values of 10,100,1000 and 47,000 ohms, or as requested, are available from a back panel mounted switch. By "total transperancy" I mean that it has a complete lack of "electronic" sound -it's unvieled and revealing but totally natural. And with a 600 ohm output impedance it drives any power amp effortlessly. Transformer coupled preamps are very rare in the commercial world as they are expensive to produce but once heard it's very hard to go back to conventional pres which sound thin and sterile in comparism. The preamp uses a special shunt regulated power supply that contributes to it's clarity ,accurate response and tight bass. Not one, but two, one for each channel-it's overkill but sonically pleasing-they are the large 5881 tubes towards the rear of chassis. The power transformers and tube rectifier are in seperate chassis for quiet, noise free operation , even with very low gain Moving Coil cartridges. As with all SUPRATEK amps the transformers are of the finest quality--the power transformer is big enough for a substantial power amp and the amorphous core output transformers have been specially chosen for the preamp. All chassis are made from stainless steel or copper/chrome plated or other finishes are available. Beautiful Jarrahwood cabinets make these preamplifiers visually stunning. Standard is 4 inputs plus an optional tape monitor with tape record and tape play . Two outputs are supplied-a total of 16 RCA sockets on the back panel. A balanced XLR output is also supplied. There have been great advances in digital sound in this century, but vinyl still has a wonderfully real and alive sound when used with a tube phono stage of this quality. However your CD's and digital sources will sound completely revitalised and "alive" with the outstanding attributes of the famous CORTESE linestage. ​The CORTESE LCR preamp is identical to the Cortese but uses a LCR (Inductance,Capacitive,Resisitive) network in the RIAA equalistaion network. The expensive Lundahl inductors used in the LCR preamp give a very worthwhile improvement in the phono stages vividness and sense of midrange realism. LCR networks are used in some of the worlds most expensive phono preamplifiers, but the CORTESE LCR is the only moving coil capable LCR phono preamp. Incredible sound, incredible value. The same phono stage as used in the Cortese, in a stand alone package. No linestage. 2 phono inputs 1 output. Copper chassis chromeplated or powder coat . Compact "black box" power supply for ease of placement. Exact same performance as Cortese phono stage. Phono stage only version of the CORTESE LCR, in a stand alone package. ​The Cabernet linestages have evolved over the years to be the highest performing tube linestages available, at any price. The first Supratek linestages used 6SN7 tubes and they are still the most suitable preamp tubes available. Using circuits that have been refined over many years, and devopled for finest sound and extreme reliability,a Cabernet will transform your listening experience with more precise imaging and soundstaging, a pure natural sound and a presence to the music you will not have heard before. As with all the Supratek preamps they are over-engineered with high rating power transformers, the finest quality components in highly evolved power supply and signal circuitry. 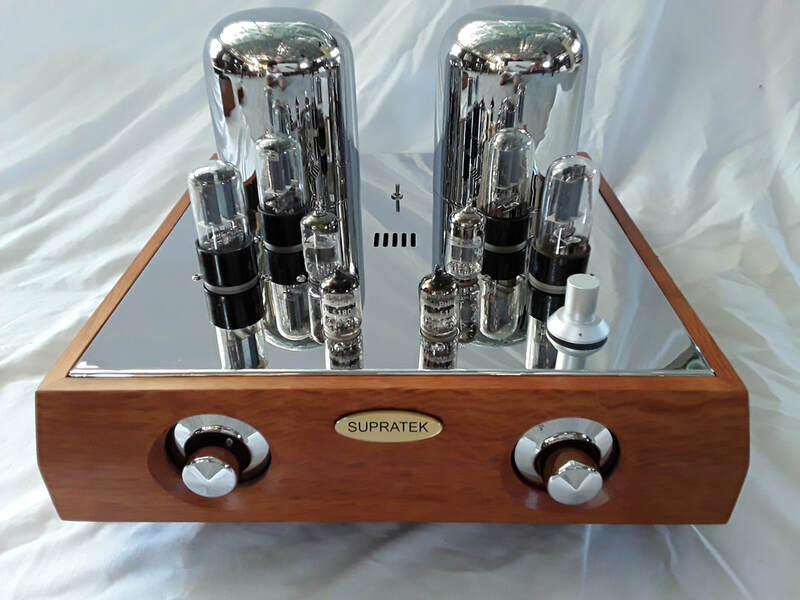 Supratek has an enviable reputation for reliability and long life- the Cabernets have already gained "classic" recognition and they are, and will remain, State Of The Art tube preamps. ​Supratek released the first commercially available DHT preamp back in the early 90's. It used 300B tubes and was followed by a DHT preamp that could use 300B,45 and PX4 tubes. A preamp that used 101D was very highly regarded for many years, and other manufacturers released similar, less engineered models. Today, the Supratek DHT Cabernet uses a 6SN7 driver stage with 300B output tubes, but has a switch and servo system that also allows the use of 45 and 2A3 tubes. Simply replace the output tube , switch to correct position and listen to music. The 300B sound has been described as "gorgeous" with a warm musicality, whilst the 45/2A3 are perhaps more accurate and detailed sounding- the choice is yours with the DHT Cabernet. Huge power supply , tube shunt regulated, negligible hum and noise free operation, and adjustable gain control to suit any power amplifier. DHT 300B or 6SN7 CABERNET? ​Both versions are technically very accurate, have low output impedance and adjustable gain in order to be able to drive, and match any amplifier. Both versions are very musical and sonically satisfying , however the DHT has a touch of tube "bloom" and euphonics, which give's a satisfation to those who desire a sense of euphoria to their music. ​In production for over 10 years the Cabernet Dual has the 6SN7 linestage and a seperate, independent 6H30 linestage with its own level control. Both are then controlled by a master volume. This arrangement is ideal for bi-amping , allowing for very precise adjustment of bass and mid/treble in loudspeakers with bi-amp connectors. It can also be used as a subwoofer control. Loudspeaker designers are always compromised in selecting the tonal balance of a loudspeaker but with a Dual Cabernet you can easily adjust tone to suit room and your taste. Over the years Supratek has produced many types of tube power amplifiers- Single Ended, Push Pull and OTL. Some examples of which we were particulary proud of were the MERLOT SE monoblock amps which used 6Sn7, 300B and 6C33C-B tubes. The finest examples used Plitron interstage,output and power transformers, sadly no longer available. Plitron outputs were also used in the BURGANDY 100 watt push pull amp using 4 6C33C-b tubes per channel- clean,powerful and natural sound. See the Gallery page for images of these amplifiers. Supratek can build any type of power amplifier to custom requirements. For a modern conventional tube amplifier its hard to go past the EL34 tube in a push pull ultralinear configuration- in a well designed amp its always sweet sounding and able to drive most speakers. 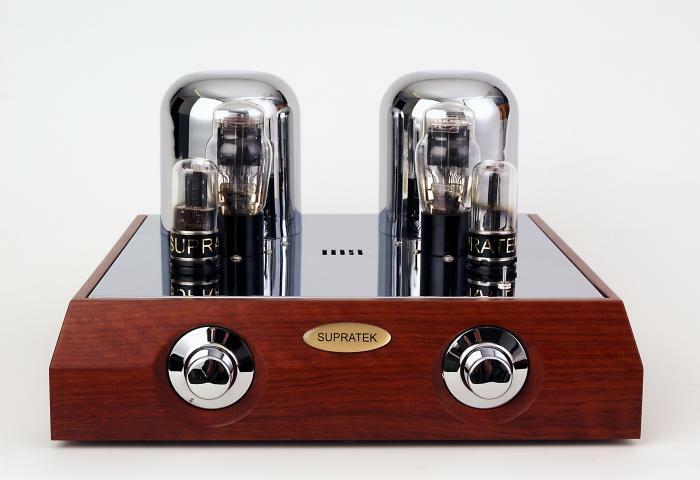 Supratek still produces the MALBEC monoblocks using 4 EL34 tubes in a class A 30 watt design. 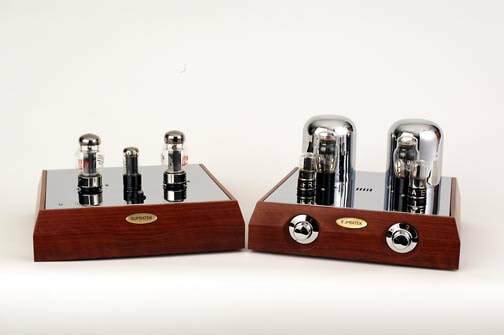 The MONDEUSE use EL34,KT66,6N3C, or KT88 tubes for 100 watts Class AB. Both amps match perfectly with the Supratek preamps, both in compatability and style. ​Built to custom order only. All the Supratek products are handbuilt by Mick Maloney in Margaret River, West Australia. He has been designing and building tube equipment for over 25 years and has built close to 700 Supratek preamps and power amps. In addition to this he has designed and built many, many prototype designs that have evolved into the Supratek range. The basic philophosy of Supratek is to build the finest sounding preamps, with exquisite aesthetics and high functionability. The product must be of the highest build quality and reliability . It should work faultlessly for many years with minimum or zero maintenance. Every product is built to become a "classic" piece , that will be as relevant in 20 years as it is now. And that is what has happened- virtually all of the Suprateks are still in service , some over 20 years old with original tubes in them. Because they are so over-engineered and robust Supratek provides a lifelong warranty (excl freight) that is transferable. Only Supratek can offer such a warranty, as the products are so trouble free and dependable, and with no , or minimal PCB boards, they are simple to service. As the preamps are built by one man, it is possible to custom build to owners requirements- if you have a particular requirement we can probably help you achieve audio nirvana.